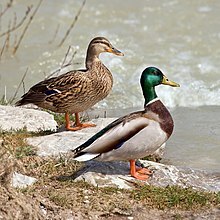 The muir deuk (/ˈmælɑːrd/ or /ˈmælərd/) or wild duck (Anas platyrhynchos) is a dabblin deuk which breeds throuoot temperate an subtropical Americae, Europe, Asie, an North Africae, an haes been introduced tae New Zealand, Australie, Peru, Brazil, Uruguay, Argentinae, Chile, the Falkland Islands an Sooth Africae. ↑ Long, John L. (1981). Introduced Birds of the World. Agricultural Protection Board of Western Australia. pp. 21–493. This page wis last eeditit on 5 October 2018, at 06:33.